How ironic and juicy is the story line that all that stands between the New York Jets’ playoff berth, is their former coach, Rex Ryan. The Jets are in their first season under new head coach Todd Bowles. Tomorrow night they will face a do or die, win-and-in scenario against the Buffalo Bills, who is coached by Ryan, the Jets former coach, was fired after failing to get them to the postseason in the last four of his six seasons spent there. The Jets are 10-5, and at the offset were considered to be a team outside the playoff picture. They changed their destiny and overcame the odds when they won 26-20 in overtime last Sunday over the New England Patriots. They got lucky when opposing coach Bill Belichick choose to kick off rather than start the extra period on offense. That’s how Ryan Fitzpatrick was able to coolly march the Jets down field and win it with a 6-yard pass to Eric Decker. The Pittsburgh Steelers also helped out, they held a tiebreaker edge over New York, and then went and lost to the Baltimore Ravens, slipping behind the Jets in the playoff standings. Because of the Denver Broncos’ 20-17 overtime win over the Cincinnati Bengals Monday night, the Jets can earn a berth with a win tomorrow night, or if Pittsburgh loses to Cleveland on Sunday, but that’s a long shot. The Jets will get a chance to prove how badly they want it against a Buffalo Bills team that have a disqualifying 7-8 record. The Bills after hiring Ryan had high hopes in his first season, especially when he publically declared that their playoff drought would end with him at the helm. Instead, they’ll miss out for the 16th year in a row. It’s tough times in Buffalo. So wouldn’t Ryan just love to spoil the Jets chances of getting in? If he can’t go, then why should they right? It would be sweet revenge if after spending six years doing everything he could to get the Jets into the postseason, Ryan will be the one out to keep them from getting in this year. “It’s just the next game on the schedule,” cornerback Jets Darrelle Revis downplayed the matchup to local media. Ryan already holds the advantage as his Bills went 1-0 against the Jets in a 22-17 victory in Week 10. Back then, Ryan was happy with the win, he also sagely predicted that the two teams’ next meeting would probably decide who went to the playoffs. He’s half-right since the Bills have no chance, but this match up must seem destined to him. On Monday in a media scrum, Ryan praised the Jets’ play, and didn’t add any extra fuel to the fire. After their loss to the Bills, the Jets lost to the Houston Texans 24-17 and dropped to 5-5 on the season. Their near perfect 4-1 start was wasted by inconsistant play, lost opportunities and the Jets are still searching for answers. “We had to come together,” Pace said, “or the ship was gonna sink.” Since then though they haven’t lost, so something clicked. Fitzpatrick’s string play during their winning streak has been a MVP-like performance. He has thrown for 1,525 yards and 13 touchdowns with one interception. In three of the last four games, Fitzpatrick has driven the Jets to a win in the final 2 minutes of regulation or overtime. “Fitz has been amazing for us,” Pace said. 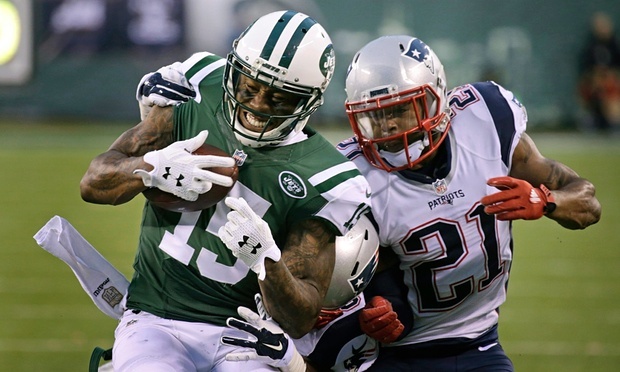 So has Brandon Marshall, who set the franchise’s season record with 101 catches – and counting. Decker has, too, with 75 catches, including 11 TD grabs. The defense has also been solid the past month, it’s the same front line that made things miserable for Tom Brady and the Patriots. Since week 10, the injured Bills went in the opposite direction since the teams met. They lost four of five before beating Dallas 16-6 last Sunday. But they’ll be motivated by the chance to be a deciding factor in the final days of the AFC playoff race. “This will be a playoff game for us,” Bills left guard Richie Incognito said. Defensive tackle Marcell Dareus hopes he will get the chance to play despite having to leave last week’s win, due to a pinched nerve in his neck. The Bills might play it more cautious with leading rusher LeSean McCoy though, after he sat out last week due to a knee injury. Ryan told media that he’d rather the Bills were in playoff spot than be in a spoiler role, and was clear that facing his former team didn’t mean anything special to the final game of their campaign. “Just us getting a win against a good football team is great,” Ryan said. “I don’t care if we play East Carolina, you want to get a win, period.” Ryan did say though that Bills players might motivated by the chance to keep their AFC East rivals out of the playoffs. We don’t think the Bills will miss this chance, at home.